Blaise’s daydream takes us to the stage of the Harp & Trumpet on Page 2 of Winter Fantasy. Blaise, like most of us, sounds better in the shower or in our dreams. 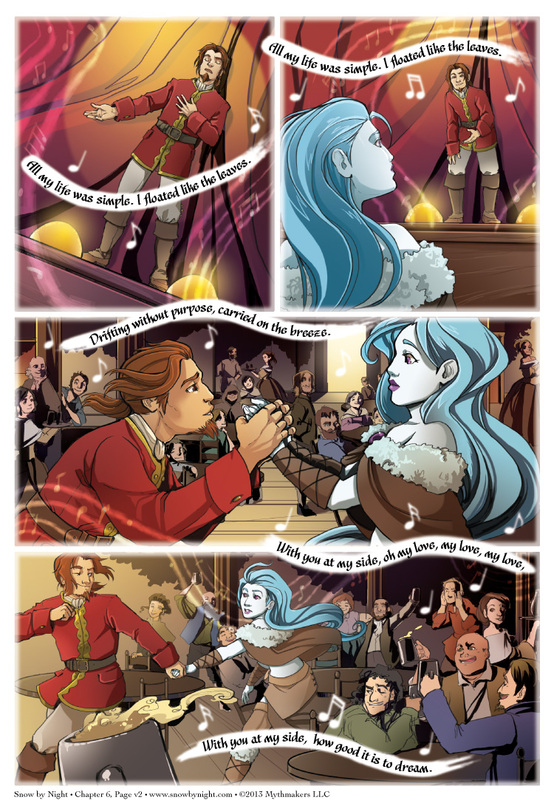 To see Julie’s gorgeous rendition of the outside of the Harp & Trumpet, please vote for Snow by Night on Top Web Comics. Very cute; very pretty. I love the style. Awww…. Poor guy’s got it bad. Just wanted to say that Julie’s art is some of the most incredible stuff I’ve ever seen.